Penguin Magic are currently holding a contest to see if they can find the world’s fastest coin roller. 1. The set time is one minute. 2. The coin must be US currency in current circulation. 3. 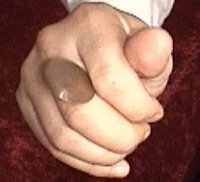 The coin must start between the thumb and first finger, make a revolution around the hand, and it’s counted as ONE when it reaches that thumb and first finger position again. 4. The coin is not allowed to skip a finger. 5. The coin is not allowed to drop during the set time. 6. You can perform the coin roll with either your left hand or your right hand. https://www.bradmontgomery.com/wp-content/uploads/2018/11/logo-1-495x198-1-300x120.png 0 0 admin https://www.bradmontgomery.com/wp-content/uploads/2018/11/logo-1-495x198-1-300x120.png admin2005-10-25 09:47:042005-10-25 09:47:04Magicians.... skill! Magicians’ Tricks for Free Sad? Can ya Laugh?